Joining an expedition to Antarctica with MS Midantsol is sure to rank among the most exciting things you’ll ever do. Together, we will explore the most remote place on earth, on an adventure that takes you to the unparalleled highlights of Antarctica. Imagine waking up on Christmas day and pulling back the cabin curtains to reveal a pristine vista of mountains, penguins and ice! The adventure starts as we sail the famous Drake Passage before arriving in remote Antarctica. The excitement builds as we draw close and encounter the astounding wildlife of the last untouched continent. You will see whales, meet thousands of penguins and encounter some seriously cute seals. And the icebergs constantly drift by in fantastic variety, in all shapes and colours. The horizon seems endless and blue-white, the oceans are teeming with life. Our small craft excursions will take you through the icebergs and each journey will serve as a reminder that you are now a true polar explorer. Back on board, you’ll have opportunities to learn and share discoveries with family and new friends in relaxed atmosphere. MS MIdnatsol is a ship built and designed to meet the needs of modern explorers – both on and off board. Our Science Center is a great place to meet fellow adventurers of all ages for scientific fun with our engaging Expedition team. The media room on board shows the highlights of the day, and if you haven’t joined an excursion or landing, you can see films and photos to share in the adventures at the end of each day. All scientific content is presented in a lively, fun and easily understood manner: first class edutainment, so to speak. Join us on a voyage to the extreme south of planet and create the adventure of a lifetime. Inside cabin, 6 – 10 m2 (65 – 108 sq ft) separate beds, one bed can be turned into a sofa. Some with upper / lower berths. Outside cabin, 7 – 13 m2 (75-140 sq ft), with portholes, separate beds, one bed can be turned into a sofa.Some with upper/lower berths. 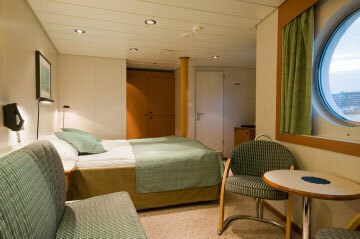 Outside cabin, 8 – 13 m2 (86-140 sq ft), these cabins have separate beds where one doubles as a sofa. Upper and middle decks. Suite, 28 – 30 m2 (301-323 sq ft), one or two rooms, seating area, TV, mini-bar, some with private balcony. This adventure starts with an overnight stay in Buenos Aires, the bustling capital of Argentina. We offer an optional city tour in the afternoon. Spend the evening at your leisure and discover ”Paris of South America” for yourself. Fly early in the morning to Ushuaia, where MS Midnatsol awaits. Once on board, we kick off our journey with a welcome-on-board dinner. Prepare yourself for Antarctica as we cross the infamous Drake Passage, and trust us - it will overwhelm you! MS Midnatsol is designed to bring polar exploration to all ages and learning levels. There will be lectures on the environment around us, films about Antarctica and the Activity Center provides the latest technology for preserving your memories. This Center is the heart of the expedition community, a friendly place to gather for talks, recaps and spontaneous events, and a warm area to mingle and share stories. Days 5 - 14 Antarctica … another world! You are now in one of the most remote areas on earth! Venture ashore to explore the breath taking Antarctic scenery and come close to penguins and seals. You will feel like a real explorer from the moment you first set foot on the endless expanse of snow and ice. From the deck, there will be ample opportunities to sight whales. Enjoy close encounters with wildlife and glaciers, old whaling stations and relics as we sail. One of the highlights is Deception Island in the South Shetlands. When we sail into the natural harbour of this volcanic island, you will see an abandoned whaling station known as Hektor and a derelict British base. We are certain you will enjoy a visit to Half Moon Island, a staggeringly photogenic island blessed with some of the most beautiful Antarctic scenery imaginable, or Yankee Harbour, with its large colony of Gentoo penguins, estimated to be 4,000 breeding pairs. Cuverville Island is home to another of the largest known colonies of Gentoo penguins, while Neko Harbour is beautifully located in the innermost part of Andvord Bay. Paradise Harbour got its descriptive name from the whalers during the last century. Wilhelmina Bay has stunning scenery and is often called “Whale-mina Bay”, because of the large number of humpback whales spotted here in December. We have planned plenty of activities to help you experience Antarctica in the best way. This might mean that one day you will go shore to see penguins and hear the crackling noise of glaciers. The next day, you may get to feel the salt and wind as you cruise between the sea ice, looking for leopard seals taking a nap on an ice platform. A third day may involve kayaking or a longer hike or walk. Back on board, we host activities that will satisfy a whole range of interests in the Explorer Room. The on-board photographer will show you the basics of expedition photography. Join gatherings where the Expedition team recount the day’s activities, make presentations, and the Expedition leader discusses the next day’s plan. These gatherings are great opportunities for sharing and mingling with the expedition community. Christmas Day will be a unique mix of exciting activities amongst the ice and penguins, combined with traditional Norwegian celebrations on board. You might enjoy a special lunch followed by a walk to the top of a snow-covered hill set within a glaciated bay. Or your Christmas gift may be a cruise amongst ice bergs followed by a visit from a certain white-bearded gentleman. After exploring this exhilarating continent, we set course back to civilisation. Spend the day at sea recapping your experiences, having fun in the Activity Center or just relaxing on deck. Sadly, every adventure must come to an end. It is time to say goodbye to the crew and all your new friends when we reach Ushuaia. We transfer you to the airport for your flight back to Buenos Aires. If you haven't had enough adventures, you can extend your stay and enjoy our optional post expedition programmes. You could celebrate New Year with a stylish stop-over in Buenos Aires, for example. MS Midnatsol has a strong environmental profile and a modern design. The interior’s bright, colourful décor is inspired by the warm sunny climate, a motif also reflected in the many pieces of Norwegian modern art on display. She is also a TV star, being featured in the award winning documentary "Hurtigruten 365", made by Norwegian TV. On deck 9 you find the sun deck and a Jacuzzi. Key qualities of the MS Midnatsol include the large, two-story panorama lounge above the bow, and the large glass expanses that allow natural light to enter, while providing extraordinary views. MS Midnatsol is an ice class 1X ship and equipped with advanced technology, making her very well suited for expedition voyages in Antarctica. The essence of Norway’s appeal is remarkably simple: this is one of the most beautiful countries on earth. Join a 12-day adventure that is unmistakably Norwegian, across almost 2,500 nautical ......click here to read more. From Arctic wilderness to UNESCO heritage city charm – think of your southbound Hurtigruten voyage as the ultimate journey. You begin in Kirkenes, gateway to the Barents region and close ......click here to read more. Close encounters with Antarctic wildlife Taking an expedition to Antarctica with MS Midnatsol is sure to rank among the most exciting things you’ll ever do: exploring the most remote place ......click here to read more.